On February 27, 2013, Pope Benedict XVI held his final general audience in Saint Peter's Square. It was one of the largest of his pontificate—and, indeed, of any pontificate—as more than 200,000 people gathered to wish the Holy Father farewell, the day before his resignation took effect at 8 P.M. on February 28, 2013. While Pope Benedict's remarks at this final general audience were not his final public words—he is expected to offer a few words on February 28, when he arrives at the papal summer residence of Castel Gandolfo, where he will remain in seclusion until the upcoming conclave chooses his successor—they are likely the final public address of any length to be offered by this remarkable man, whose entire life has been lived in service to Jesus Christ and the Church that He founded. 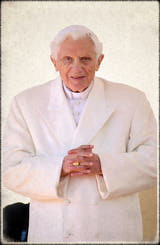 From the first, Pope Benedict's Wednesday general audiences have featured meticulously prepared remarks on points of doctrine or the lives and writings of saints, especially the Fathers of the Church and the doctors of the Church; but his words at his final general audience, while reflecting Pope Benedict's profound intellect, came even more from the heart than from the head. His deep gratitude to those gathered to wish him well was apparent; but so was his gratitude to Christ for having called him to a lifetime of service in the "vineyard of the Lord." Like the Apostle Paul in the Biblical text that we have heard, I feel in my heart that I have to especially thank God who guides and builds up the Church, who plants His Word and thus nourishes the faith in His People. At this moment my heart expands and embraces the whole Church throughout the world and I thank God for the 'news' that, in these years of my Petrine ministry, I have received about the faith in the Lord Jesus Christ and for the love that truly circulates in the Body of the Church, making it to live in the love and the hope that opens us to and guides us towards the fullness of life, towards our heavenly homeland. At this moment I have great confidence because I know, we all know, that the Gospel's Word of truth is the strength of the Church; it is her life. The Gospel purifies and renews, bearing fruit, wherever the community of believers hears it and welcomes God's grace in truth and in love. This is my confidence, this is my joy. When, on 19 April almost eight years ago I accepted to take on the Petrine ministry, I had the firm certainty that has always accompanied me: this certainty for the life of the Church from the Word of God. At that moment, as I have already expressed many times, the words that resounded in my heart were: Lord, what do You ask of me? It is a great weight that You are placing on my shoulders but, if You ask it of me, I will cast my nets at your command, confident that You will guide me, even with all my weaknesses. And eight years later I can say that the Lord has guided me. He has been close to me. I have felt His presence every day. It has been a stretch of the Church's path that has had moments of joy and light, but also difficult moments. I felt like St. Peter and the Apostles in the boat on the Sea of Galilee. The Lord has given us many days of sunshine and light breezes, days when the fishing was plentiful, but also times when the water was rough and the winds against us, just as throughout the whole history of the Church, when the Lord seemed to be sleeping. But I always knew that the Lord is in that boat and I always knew that the boat of the Church is not mine, not ours, but is His. And the Lord will not let it sink. He is the one who steers her, of course also through those He has chosen because that is how He wanted it. This was and is a certainty that nothing can tarnish. And that is why my heart today is filled with gratitude to God, because He never left—the whole Church or me—without His consolation, His light, or His love. We are in the Year of Faith, which I desired precisely in order to strengthen our faith in God in a context that seems to relegate it more and more to the background. I would like to invite everyone to renew their firm trust in the Lord, to entrust ourselves like children to God's arms, certain that those arms always hold us up and are what allow us to walk forward each day, even when it is a struggle. I would like everyone to feel beloved of that God who gave His Son for us and who has shown us His boundless love. I would like everyone to feel the joy of being Christian. In a beautiful prayer, which can be recited every morning, say: 'I adore you, my God and I love you with all my heart. Thank you for having created me, for having made me Christian...' Yes, we are happy for the gift of faith. It is the most precious thing, which no one can take from us! Let us thank the Lord for this every day, with prayer and with a coherent Christian life. God loves us, but awaits us to also love Him! It is not only God who I wish to thank at this time. A pope is not alone in guiding Peter's barque, even if it is his primary responsibility. I have never felt alone in bearing the joy and the weight of the Petrine ministry. The Lord has placed at my side so many people who, with generosity and love for God and the Church, have helped me and been close to me. First of all, you, dear Brother Cardinals: your wisdom, your advice, and your friendship have been precious to me. My collaborators, starting with my secretary of state who has accompanied me faithfully over the years; the Secretariat of State and the whole of the Roman Curia, as well as all those who, in their various areas, serve the Holy See. There are many faces that are never seen, remaining in obscurity, but precisely in their silence, in their daily dedication in a spirit of faith and humility, they were a sure and reliable support to me. A special thought goes to the Church of Rome, my diocese! I cannot forget my Brothers in the episcopate and in the priesthood, consecrated persons, and the entire People of God. In my pastoral visits, meetings, audiences, and trips I always felt great care and deep affection, but I have also loved each and every one of you, without exception, with that pastoral love that is the heart of every pastor, especially the Bishop of Rome, the Successor of the Apostle Peter. Every day I held each of you in prayer, with a father's heart. I wish to send my greetings and my thanks to all: a pope's heart extends to the whole world. And I would like to express my gratitude to the Diplomatic Corps accredited to the Holy See, which makes the great family of Nations present here. Here I am also thinking of all those who work for good communication and I thank them for their important service. At this point I would also like to wholeheartedly thank all of the many people around the world who, in recent weeks, have sent me touching tokens of concern, friendship, and prayer. Yes, the Pope is never alone. I feel this again now in such a great way that it touches my heart. The Pope belongs to everyone and many people feel very close to him. It's true that I receive letters from the world's notables—from heads of states, from religious leaders, from representatives of the world of culture, etc. But I also receive many letters from ordinary people who write to me simply from their hearts and make me feel their affection, which is born of our being together with Christ Jesus, in the Church. These people do not write to me the way one would write, for example, to a prince or a dignitary that they don't know. They write to me as brothers and sisters or as sons and daughters, with the sense of a very affectionate family tie. In this you can touch what the Church is—not an organization, not an association for religious or humanitarian ends, but a living body, a communion of brothers and sisters in the Body of Jesus Christ who unites us all. Experiencing the Church in this way and being able to almost touch with our hands the strength of His truth and His love is a reason for joy at a time when many are speaking of its decline. See how the Church is alive today! Allow me here to return once again to 19 April, 2005. The gravity of the decision lay precisely in the fact that, from that moment on, I was always and for always engaged by the Lord. Always—whoever assumes the Petrine ministry no longer has any privacy. He belongs always and entirely to everyone, to the whole Church. His life, so to speak, is totally deprived of its private dimension. I experienced, and I am experiencing it precisely now, that one receives life precisely when they give it. Before I said that many people who love the Lord also love St. Peter's Successor and are fond of him; that the Pope truly has brothers and sisters, sons and daughters all over the world and that he feels safe in the embrace of their communion; because he no longer belongs to himself but he belongs to all and all belong to him. 'Always' is also 'forever'--there is no return to private life. My decision to renounce the active exercise of the ministry does not revoke this. I am not returning to private life, to a life of trips, meetings, receptions, conferences, etc. I am not abandoning the cross, but am remaining beside the Crucified Lord in a new way. I no longer bear the power of the office for the governance of the Church, but I remain in the service of prayer, within St. Peter's paddock, so to speak. St. Benedict, whose name I bear as Pope, will be a great example to me in this. He has shown us the way for a life that, active or passive, belongs wholly to God's work. I also thank each and every one of you for the respect and understanding with which you have received this important decision. I will continue to accompany the Church's journey through prayer and reflection, with the dedication to the Lord and His Bride that I have tried to live every day up to now and that I want to always live. I ask you to remember me to God, and above all to pray for the Cardinals who are called to such an important task, and for the new Successor of the Apostle Peter. May the Lord accompany him with the light and strength of His Spirit. He was quite the Pope.